In addition to increasing labor costs, startups in San Francisco are facing monotonically increasing real estate prices. 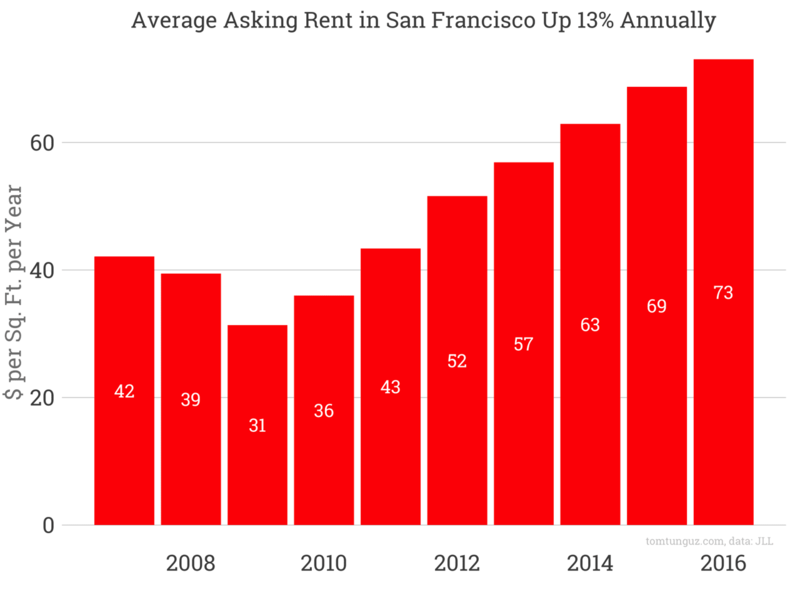 JLL the real estate broker shared their data on the average asking rent in San Francisco from 2007 two 2016, year to date. In 2009, the average asking rent was $31.37. In 2016 that number has more than doubled to $73.05, for an average annual increase of just about 13%. The most expensive neighborhood in San Francisco is Mission Bay/China basin at approximately $85 per square foot per year for class A real estate, followed by South market for an average of $80 per square foot. Rising prices reflect an increase of demand. Total vacancy rate has dropped to 8% from a high in 2010 a 17.1%, meaning only 8% of available spaces are available to be rented. But the trend does show some signs of slowing. The chart above shows net absorption of real estate. A positive number indicates more real estate was leased than was vacated and was built. From 2011 two 2015 we’ve seen more than 1.4M sq. ft. per year, with recent years exceeding 2M sq. ft. But 2016 is on track to be the lowest in six years at an annual rate of just about 1M sq. ft. New leasing activity in 2016 is on track to be about 69% of 2015. This decline in absorption and leaning activity has decreased the year on year average asking rent in gross dollar terms already, and suggests that at least plateau is near, if not a decline in prices. This decline in demand for real estate reflects a changing fundraising environment where many startups are conserving cash, shifting plans to profitability rather than growth at any cost. 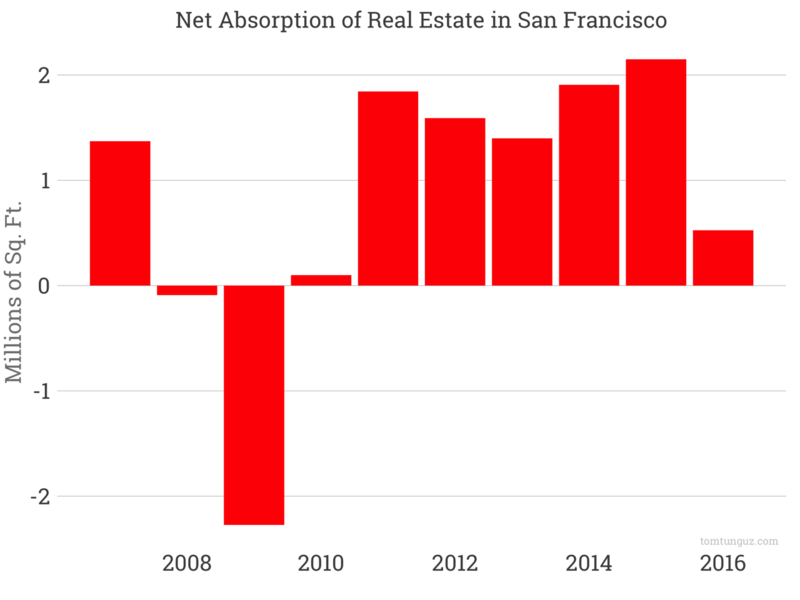 Perhaps at some point in the not-too-distant future, the startups will also begin to benefit from decreasing prices of San Francisco real estate.